There’s no better way to celebrate summer than with hot ribs and cool jazz. 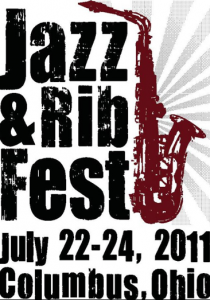 The 32nd annual Columbus Jazz & Rib Fest presented by the Columbus Recreation and Parks Department returns to the Arena District riverfront on July 22-24. Three stages will host the finest local and international jazz artists, while barbeque pit masters serve up sizzling ribs, chicken and more. Savor the best ribs from around the country as 23 award-winning barbeque teams compete for “Best Ribs” bragging rights. The aroma of hot ribs and sounds of cool jazz will fill the air on July 22 and 23 from 11 a.m. – 11 p.m., and July 24 from 11 a.m. – 8:30 p.m. Admission is free. Jazz & Rib Fest is presented by the Columbus Recreation and Parks Department and made possible through the generous support of American Electric Power, Anheuser-Busch, Sunny 95 WSNY, The Ohio Lottery, Crowne Plaza and ASCAP. Date & Time: Friday, July 22, 11 a.m. – 11 p.m.
Saturday, July 23, 11 a.m. – 11 p.m.
Sunday, July 24, 11 a.m. – 8:30 p.m.